Over a decade since Panic! At The Disco’s emergence, central figure Brendon Urie stands alone as the sole remaining founding member of the group. Now Panic! officially functions as Urie’s nom de plume—which unofficially, it always was. With no one to answer to, Urie, aided by producer and co-songwriter Jake Sinclair (Fall Out Boy, Weezer), lets loose on the fifth Panic! album, Death Of A Bachelor. 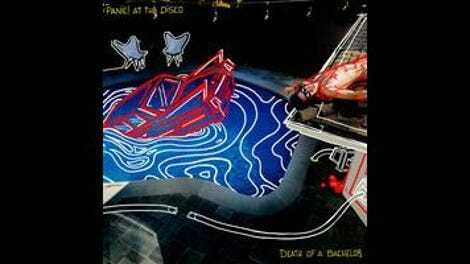 This means that Urie’s hip-hop and jazz influences can now roam wild in Panic!’s very modern rock setting. What stands out most on Death Of A Bachelor is the Frank Sinatra-style numbers “Impossible Year” and the title track. Urie’s belting powerhouse voice naturally lends itself to the crooning style that has successfully wooed for over half a century, and continues to do so. One of the reasons this radical change works on Death Of A Bachelor is the simplicity of the songs. Remove the vocals from the title track, and all that’s left is digitally generated bass plus programmed and sampled drums. On “Impossible Year,” Urie’s voice effortlessly changes key with each verse, but the musical backdrop is only piano, bass, and horns. Big band brass, which shows up on every song, is another new element on Death Of A Bachelor that ups Panic! At The Disco’s game. It melds well with the signature chanting choruses and slick, Hot Topic-ready anthems that have been the standard Panic! fodder, making them that much stronger. Strains of the B-52s’ “Rock Lobster” kick off “Don’t Threaten Me With A Good Time” and are threaded through its chorus. This is a sharp contrast to the swagger of “Hallelujah,” which is modern rock gospel, and “Emperor’s New Clothes,” a fairy tale with nursery rhyme cadence fitting its title. Even the swingy “The Good, The Bad And The Dirty,” perhaps the most Panic!-by-numbers song on the album, has an extra bright sheen to it, underscored by hiccup hip-hop record scratches.